A QuakeWrap innovation solves a major infrastructure repair problem, this time helping repair a large gas pipe in New Jersey. Congratulations is deserved for everyone involved with this Project of the Year- Rehabilitation recognition from Trenchless Technology magazine. The PipeMedic® carbon FRP laminates used in the project – also known as SuperLaminate™ - is a patented product developed by Prof. Mo Ehsani, President, QuakeWrap, Inc. The laminate is only 0.024 inches thick, but is stronger than steel. 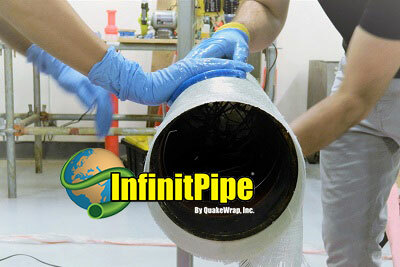 Contact us at info@quakewrap.com for more on this super strong, versatile pipe repair solution. (InfinitPipe.com) -- The very first green and sustainable pipe has been awarded a $100,000 federal research grant to explore its potential as a sustainable yet durable resource for agriculture. “InfinitPipe: An Economical Sustainable Pipe for Agricultural Use,” a proposal submitted by QuakeWrap, Inc. describing this new game-changing pipe technology, is the winner of a support grant from the U.S. Department of Agriculture's (USDA) National Institute of Food and Agriculture (NIFA). QuakeWrap is the only company from Arizona to win the grant. “The relatively simple construction technique of InfinitPipe will allow farmers to purchase the raw materials and lease the equipment to build the pipes they need,” said Dr. Mo Ehsani, principal investigator of the proposal and a pioneer in the introduction of fiber reinforced polymer (FRP) products for repair and strengthening of structures since the late 1980s. FRP is the major component used in the construction of InfinitPipe, and the USDA-supported research focuses on the unique construction and feasibility as an impermeable pipe which can be made readily available for agricultural applications. Find more information on the InfinitPipe.com website here. Two engineers with a steady focus on infrastructure innovations -- and representing both new and expert structural engineering perspectives -- are the Engineers of the Year 2018 as chosen by the Southern Arizona Branch (SAB) of the American Society of Civil Engineers (ASCE). 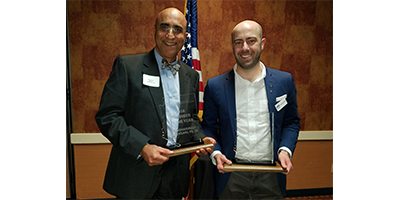 QuakeWrap Engineer Austin Urton and President/CEO Dr. Mo Ehsani were honored with Engineers of the Year recognition for 2018. Urton is the Young Engineer of the Year and Ehsani is the Engineer of Year for Southern Arizona in 2018. The two were recognized by ASCE SAB at a special ceremony during Southern Arizona E-Week. Both kudos are awarded to the engineers contributing significantly to the field of engineering in Arizona. As a student, Young Engineer of the Year Austin Urton served as an officer in the student chapter of the ASCE. After graduating with a Bachelor of Science in 2011, Urton started his engineering career as a graduate research assistant at the National Optical Astronomy Observation (NOAO), where he was responsible for the design and analysis of mirror support systems of ground-based telescopes. Urton’s experience in telescope design intricacies made him an exceptional structural engineering candidate for M3 Engineering & Technology Corporation (M3), which hired him in 2012 to design sections of telescope enclosures and ancillary support buildings for world-renowned telescopes in Australia, Northern Mexico and Hawaii. Urton’s dedication to efficient, economical and accurate design work and his ability to focus on multiple projects while maintaining quality work garnered attention from QuakeWrap, which hired him in 2017. In 2018 he was promoted to Lead Engineer in the Structural Group for his exceptional work in the QA/QC process for other engineers, as well as producing Technical Data Sheets and specifications for the use of new and old products. The Southern Arizona 2018 Engineer of the Year is Dr. Mohammad “Mo” Ehsani, PE, SE. Ehsani is Centennial Professor Emeritus of Civil Engineering at The University of Arizona and current President/CEO of both QuakeWrap, Inc. and FRP Construction, LLC. QuakeWrap is a global infrastructure renewal and repair company founded in 1994 and specializing in structural repair using fiber reinforced polymer (FRP) first developed by Ehsani in the 1980s. In addition to his role as leader of the original FRP engineering and installation companies, Ehsani is recognized both locally and internationally for his contributions to education and research, including his design and development of new, innovative methods for infrastructure repair, rehabilitation and strengthening. Ehsani received his B.S., M.S., and Ph.D. degrees from the University of Michigan. He joined the civil engineering department at UA in 1982, and in 2010 was appointed Professor Emeritus. While a tenured professor at UA, Ehsani founded QuakeWrap, and after several years of success realized there was a lack of experienced, quality FRP installation contractors, so he founded the specialty contractor FRP Construction, LLC in 2006. 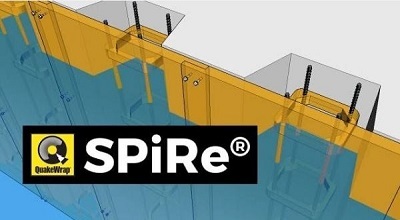 The company is now well known for its skilled installation of FRP as well as other traditional methods of construction and construction management. FRP Construction is also an outstanding safety leader, recently celebrating 4000 Days of No Lost Time from Accidents, an extremely significant safety milestone in the construction industry. 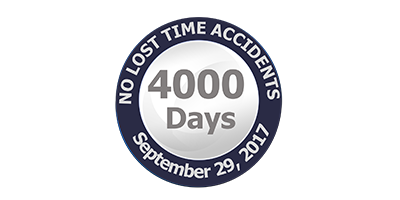 FRP Construction LLC, a specialty contractor that regularly finds itself in utility tunnels, under bridges and piers, under freeways, inside roadside culverts and much more, has achieved a significant and rare safety milestone: 4,000 days with no time lost from accidents. A lost time accident is a U.S. Occupational Safety and Health Administration (OSHA) recordable incident in which an employee is not able to return to work or is assigned restricted work on the day or shift following the incident. “Safety is a fundamental principle of our operations, and the methods we use to ensure safe work are addressed on each one of our unique installation projects,” says Adam Sedgeman, PE, MS, and Vice President of FRP Construction. Founded in 2006, FRP Construction, LLC, specializes in repair and restoration of structures using Fiber Reinforced Polymer (FRP) products. These FRP products are supplied by a variety of manufacturers, including QuakeWrap, Inc. Recent FRP Construction repair jobs include utility tunnels under the University of Arizona, freeway underpasses on I-17 for ADOT in Phoenix, cooling tower maintenance at the Palo Verde Nuclear Generating Station for APS, and steel bridge column repairs for the Indiana DOT. 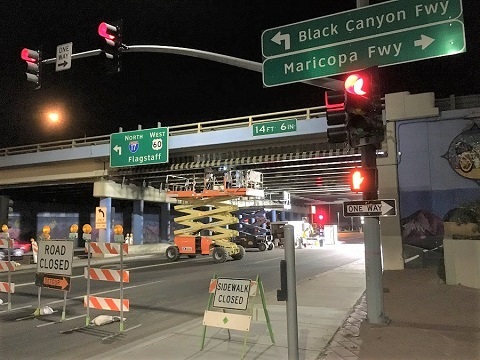 The Arizona Department of Transportation (ADOT) recently announced it used carbon fiber strips that are “coated and strengthened with a reinforcing polymer” to fix girders on two state highway bridges in Phoenix. According to ADOT, one of those bridges is no longer listed as structurally deficient as a result. QuakeWrap strengthening was applied to two bridges: The overpass at I-17 and Jefferson Street -- not considered structurally deficient – and the 19th Avenue overpass, which earlier had been labeled the most-traveled structurally deficient bridge in the state by the American Road & Transportation Builders Association. The bridge’s status has since been upgraded. See the positive media response to using advanced composites for infrastructure repair such as freeway bridges here. 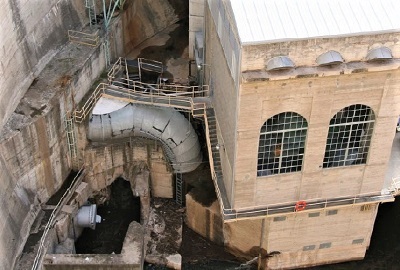 One of the strongest fiber reinforcement materials known to engineers was used to make repairs to a hydroelectric dam serving millions of customers in Central Arizona, and the details of this repair will be presented at this year’s HydroVision International 2017 conference in Denver. “Repair of Riveted Steel Penstock in Mormon Flat Dam with Carbon FRP,” will be presented by the pioneer of the technology of using FRP to repair and strengthen large structures and pipes, Dr. Mo Ehsani, Centennial Professor Emeritus of Civil Engineering at the University of Arizona. Ehsani is also currently President and CEO of QuakeWrap, Inc., the developer of innovative fiber reinforced polymer (FRP) repair solutions used for infrastructure renewal. The penstock repair using FRP presentation is scheduled as part of Hydrovision’s “Systems and Technology: What's New? What Works?” technical session, which features a group of industry specialists providing experience and lessons learned from a variety of applications, from tunnels and penstocks, to cloud applications. The presentation is scheduled for Thursday, June 29 at 11 a.m. More information on this presentation is on the HydroVision website here. View the original announcement from QuakeWrap, Inc. here. QuakeWrap, Inc. was proud to take part in a Joint Capability Technology Demonstration (JCTD) with the U.S. Transportation Command and U.S. Pacific Command (USPACOM). 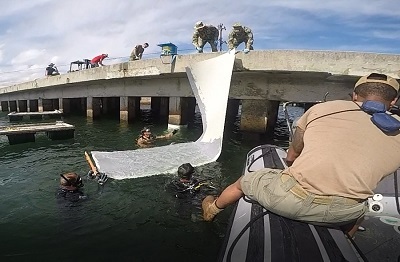 The demonstrations, in Pearl Harbor, Hawaii, involved U.S. Army and Navy divers implementing the U.S. Army Corp of Engineers PIER program. PIER allows for repair of a damaged structure within days instead of months, or even years, which in turn supports a variety of missions. 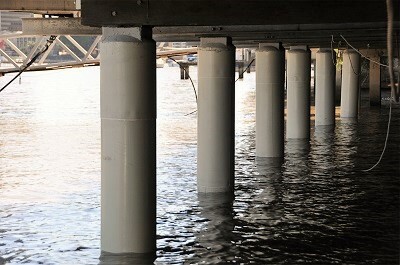 Pier pilings were repaired with QuakeWrap's PileMedic product to demonstrate the equipment’s use in the field. “This is a culminating demonstration of a two-week assessment of novel pier repair capabilities,” said Kawakahi Amina, an Operational Manager with PACOM Logistics, Plans and Exercises, in a public PACOM news release. See more of these in-water amazing pics of PileMedic by QuakeWrap in action on the QuakeWrap Facebook page here. The most efficient method of repairing and restoring corroded steel sheet piles and seawalls using FRP technology from PileMedic® makes its debut at the premier event for ocean engineering and marine development. Read the corporate announcement from QuakeWrap, Inc.. Underwater Intervention 2017, a commercial marine services conference known for attracting underwater engineering innovations, will host a presentation by PileMedic® inventor and QuakeWrap, Inc. President Prof. Mo Ehsani on new methods for repairing underwater piles, submerged pipes and steel sheet piles using FRP composites. “New Innovative Carbon FRP Solutions for Repair of Underwater Infrastructure,” is scheduled for Thursday, Feb. 23 at 10:45 a.m. in room 224 and will be an update of all the latest PileMedic® repairs and retrofits currently deployed throughout the world. The presentation will give attendees insights on the latest applications of Fiber Reinforced Polymers (FRPs) for restoring and strengthening corroded pier and bridge piles, rusting steel sheet piles, leaking submerged pipelines and more. This 2017 overview will include the development of these technologies over the last several years and how applications are being used for real world infrastructure repair today. InfinitPipe® for internal lining of corroded subsea pipelines. More information on Underwater Intervention 2017 can be found here.